It is no wonder that rare birds find a haven here within the protected marshes and miles of Colorado River shoreline. 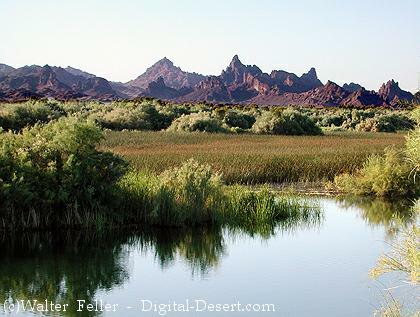 Havasu NWR forms a critical haven for wildlife in an increasingly populated part of the country. Birdwatchers come to the refuge for some of the best birding on the entire lower Colorado. Four endangered bird species find a toehold here: the Yuma clapper rail, southwestern willow flycatcher, peregrine falcon, and southern bald eagle. Look for the southwestern willow flycatcher in spring and summer darting out from a willow perch to catch a flying insect. Flycatchers join hundreds of species on the refuge, many of which are neotropical migrants, birds that nest in the United States or Canada and spend the winter south of the border in Mexico or Central or South America. Examples of these birds include hummingbirds, tanagers, and warblers. Only lucky, patient birdwatchers will spot the elusive Yuma clapper rail, a year-round, chicken-sized resident of Topock Marsh. A rail might be considered the Houdini of the bird world. A master of the vanishing act, the rail fades into the cattails, camouflages its dome nest, dives underwater if need be, freezes like a statue, and rarely calls out. A clapper rail reserves its loud kek-kek-kek-kek for the early mornings and late evenings of the breeding season. Besides the rare birds, the refuge shelters thousands of Canada and snow geese and ducks each winter. Snow geese descend like a winter squall of whirling flakes in late October after a long flight from Arctic nesting grounds. By February they are gone. 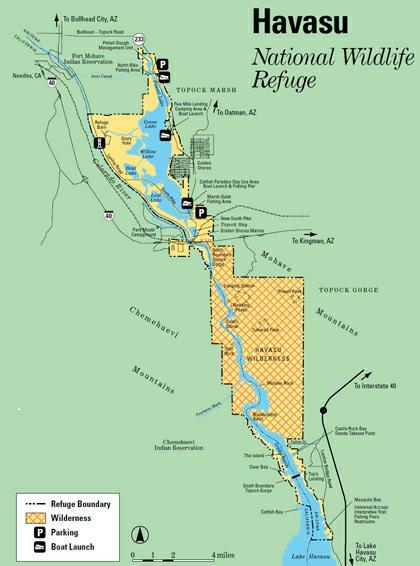 Assuring excellent habitat for wintering migratory birds is the primary goal of the refuge. Western and Clark’s grebes raise their young in both Topock Marsh and Topock Gorge. Herons and egrets nest in rookeries in the marsh. Along the river, songbirds warble from the shelter of Fremont cottonwoods, Gooding’s willow, and honey and screwbean mesquite. In the desert uplands, your best chance to see roadrunners and coveys of Gambel’s quail is during warm weather in early morning or evenings. Colorful sandstone cliffs towering above Topock Gorge form more than a spectacular backdrop for boaters. Desert bighorn sheep find a haven in this vertical world connected to the thirst-quenching Colorado river. It is easy to focus on the glamour animals like bighorns or the elusive mountain lion and overlook the foundation of the Havasu NWR ecosystems. Jackrabbits, mice, and packrats form a plentiful prey base for coyotes, foxes, and bobcats. Behind the scenes at the refuge, managers are working hard to assure that the native plants and animals have livable homes. Here are just a few examples of the work at hand.